Many people suffer from some type of allergy, be it pollen, dust, food borne, etc. A good percentage of these people also suffer from allergies to dogs and cats. What exactly is the cause of a pet allergy? Contrary to popular belief, it is not the hair or the fur that causes the allergic reaction. It is the proteins in the pet’s dander (dead skin that is shed) or in their saliva or urine. These proteins are the source of the allergens. Pet fur or hair can collect the dander and cause it to be spread around. Also, think of your pet’s fur like a dust mop. Dust and pollen can cling to it and be brought into the home, spreading additional allergens beyond the dander. Cat and dog allergens are small and sticky particles that can stay in the air for a long time. All dogs and cats produce these allergens. Many of the particles can be inhaled which causes itching and swelling of the mucous membranes. The eyes may become red and irritated. In the lungs, the allergens react with antibodies and result in breathing problems such as shortness of breath, coughing and wheezing. Hypersensitive people may break out in a rash on their face, neck and arms. The best treatment is to avoid contact with cats or dogs or their dander. For us pet lovers, this can be devastating. However, some people with allergies can try immunotherapy to alleviate the symptoms. It involves once or twice weekly injections of small amounts of the allergen. The body then produces antibodies that block the allergic reaction. It can take several months to become effective and must be continued for several years. 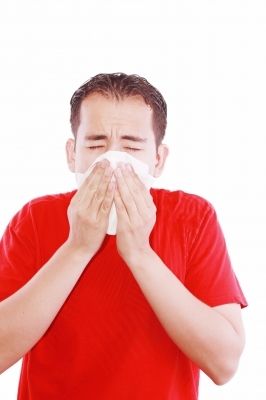 Finally, over-the-counter or prescription antihistamines and decongestants can reduce the allergic symptoms. It is up to you to determine if keeping your pet is not putting an undue burden on your quality of life. Everyone loves to hug a clean smelling pet. As our dogs age, their skin and body parts age and require different handling. Usually a dog should be bathed no more than once a month but it depends on the type of dog. Those with smooth, oily coats should only get a bath when needed. Dogs with thick undercoats can go as long as 6 months. Dogs with longer or curly hair can be bathed every 4 to 6 weeks. Senior pets, however, are prone to accidents, especially if they can’t get around too well or are growing senile. They may need baths more frequently, though sometimes spot bathing will do. Being prepared for the bath is important. Have a cup, wash cloth, several soft, absorbent towels as well as the dog shampoo close by the tub. It is very important to use a very mild shampoo that is specially formulated for an older dog. Older dogs are prone to allergies and dryness so the proper shampoo is essential. Be sure the room is warm and use warm water which will be easy on the skin and ease joint discomfort. Put an inch of water in the tub and talk to him in a loving way. Ease your dog into the water. 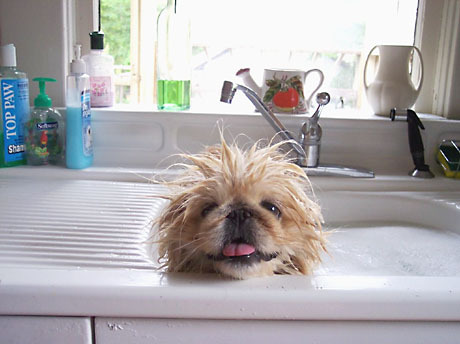 Use the cup to add more water to the bath as you pour it gently over your dog to cover his body. Use the wash cloth to clean around the eyes, inside the ears and under the chin. Bathing is a good way to check your senior dog for any changes in skin condition and to check for abnormal growths or tumors. The skin can be an indicator of internal health problems so watch for things such as dryness or roughness. As you wash your pet, use circular motions with your fingertips all over the body. This is good for the circulation and skin. Plus your pet will love the mini-massage. Rinse your pet thoroughly and rub gently with towels. Let him shake off excess water and dry with the towels. Hair dryers can be harsh for the dog”s skin, so if you must use one, keep it on low and not too close to the dog’s skin. Special attention and pre-planning will help to make bathing your senior dog an enjoyable event for both of you.